I’m a believer of agile methods, testing and experimenting. In this post, I’m writing of a very small ongoing real-life piece of “action research” – testing alternatives for putting in place an “car-on-demand” service that would enable people from our apartment building to use a car without owning one. Since our family and many neighbors do not own a car but would (maybe) occasionally want to use one, it might make sense to have an arrangement where there would be a car available somewhere nearby “on demand” ie. with a pay-per-use model. There are three main untested hypotheses I identified. Demand. Would I and others be willing to pay to use an “on-demand” car, and how often? Those who do not have a car currently have typically structured their life around not having a car, so maybe there is actually very little need for a car given the excellent bus, tram, metro and train network in Southern Finland & the opportunity to use taxi’s when needed. Supply. How many cars are needed to satisfy the demand? Is one enough, or would there need to be a way to scale up the capacity to accommodate e.g., for the fact that everyone wants to use it on the same sunny Saturday? Booking and payment system. What is a fair and easy-to-use way to determine who gets to use the car when, and how to split the costs of the car? In terms of the competitive landscape, there is currently an EkoRent electric car rental location roughly half a kilometer away, from which one can rent an electric car for 11 EUR / hour without any other costs. Another car rental company 24rent.fi has similar pricing and multiple available cars, with the closest one being one kilometer away. The service kortteliauto.fi has a very attractive cost structure especially for long-term rental (at roughly 0.4 EUR / km for overnight trip of 240 kilometers). And of course people have friends and family ready to share their cars for free, in exchange for gifts, or for a fee. So we started the journey of determining what would be the best way to go forward. And given the agile & lean mindset, of course the best way to start is by making simple experiments to learn about the real issues, and then optimize and change the concept as we learn more. First idea was to buy a used car in the price range of 2000 EUR, spend 400 EUR on insurance and taxes for first 6 months, and then divide the cost to 6 shares of 400 EUR each. Use Whatsapp channel where people send message to book the car, report mileage after their drive and the sums with which they have fueled with. Balance the books (split fuel & other costs per kilometer driven) every few months. End the experiment after 6 months, sell the car (if it did not break down earlier) and gather lessons learned. Did anyone use the car? What was the cost per kilometer? Did we experience shortages on popular days? Would it make sense to somehow automate the booking system or was it just a small pain to balance it manually? Cost of the experiment? Max 400 EUR (assuming zero value of car after 6 months – very unlikely) + any true cost per kilometer you drive. If nobody ends up using the car, the only cost was the insurance and taxes for 6 months. A competing “large scale / waterfall” based model was also proposed by others. First, it was argued that a specific car costing 17 000 EUR would be more economic in the long term given repair costs etc., and more enjoyable to drive. Second, a more “efficient” way of splitting the costs based on fixed 100 EUR fee per month was proposed on grounds of simplicity and preditability of costs. Third, kilometers would be limited to 1000 per quarter (over that, extra costs) and that limit would be tracked based on a written “driving log” in the car. Fourth, a specific credit card would be bought to pay for the fuel. In this model, the decision to join (assuming 6 families buy shares) would set you back roughly 3400 EUR for 6 months even if you do not drive at all. And the lessons learned on demand (and thus supply) will be skewed, as people basically have the incentives to drive the car for the minimum monthly allowance each month. So you would replace a bus trip with a car trip just because your marginal cost is zero for the car option. And third, you would lack unbiased estimates for the amount driven by each family (again due to the minimum quota) and consequently not learn much about the fair ways of splitting costs. This idea was rejected. Parallel to discussion between the agile-testing and waterfall-building options around Idea 1, we learned about a company that is willing to put a car to an empty space in the yard of the apartment building for zero cost, and then rent it out all persons living nearby for a variable fee of roughly 11 EUR / hour (excluding fuel), with a 1 month cancellation period for the contract. So I proposed we try this out: we commit to a 1 month test period and then decide if we want to continue. We would learn about demand and supply, and the booking system would be automated. Cost of joining the system would be zero. Of course the company would be making a profit, so this is not an optimal long term solution assuming demand would exist. On the positive side, this system would be very easy to join and leave (unlike the share-based models) so we would get a good view on how many families actually wanted to join a system like this at all. – Is this the right way to decide on this kind of a an idea, or do we need to involve the board of the building or some other way of making sure the decision is made in the right way? – Can we find alternatives as to which rental company to use? – Shouldn’t we make the company pay rent for the parking place? – Is this particular place on the yard the best place for placing the car? – Should we change the yard plan officially to make it possible to have a parking place? While these questions are interesting, they are not helping us answer the main uncertainties related to the project – supply, demand, booking & payment. Debating for example the rent of the place is a bit theoretical if we plan to do a one month test: at maximum, we are talking of 100 to 200 EUR lost rent for a month, and that money would definitely not come either if we did not launch the test! A third idea for a lean and simple solution to “on-demand car” is now brewing. The starting point it the observation that there are actually in any given point in time multiple cars in the garage that are not being used. So why buy / obtain a new car if existing capacity is not utilized to the maximum? Social barriers – is it OK or not to borrow the car? How can I repay the favour? Is my car fancy and clean enough to borrow? Lack of price level visibility – what is the right charge for borrowing a car? Free? Or X per km as it does cost money to own and maintain a car? Lack of efficient communication – how do I ask for a car to borrow? How do I advertise for a car being available? Transaction costs – is it worth the hassle to agree on the pricing and other terms (e.g., liability for damage) for this short borrowing, or should I just go with a commercial operator? So what if we could devise “general terms” and a system for car rental, ie. By launching this type of a system, we would learn about demand, supply and cost systems. We could easily tweak the “general terms” based on feedback, and if necessary, upgrade from a Whatsapp system to a more robust platform. And, if there is sufficient uptake of this model, we could consider jointly buying a dedicated car for this. I’ve now started testing with Idea 3. Instead of opening the idea to general debate within the apartment building, I’ve actually written a draft version of the “general terms” and asked a few car owners if they would be willing to borrow their cars with those terms next Saturday for 6 hours. And the first one has said yes! The difference between the waterfall way of thinking – “Diagnose, design, deliver” and the more iterative lean/agile approach – “build, measure, act” is most visible in the IT world, where much of the thinking originates. The same dichotomy can be observed also in business at large, and in the society. I think Finns have an exceptionally deeply rooted bias favoring the waterfall model. It has served us well in the traditional businesses, which are either based on designing and delivering large-scale machinery (mining equipment, pulp & paper equipment, elevators, engines etc.) or making large-scale investments (pulp plant, power plant, paper mill etc.). When you are building something irreversible out of steel and concrete, there is no opportunities for A/B testing or minimum viable product deployment. This bias towards the waterfall is also evident in the way Finnish politics and decision making work. The focus is almost always on designing and deciding the structures, policies and frameworks rather than focusing on action and change. Take the example of health care reform – so-called “sote” – where the past four years have been spent on debating the structural solutions. At the same time, front-line innovation and agile experimentation has slowed down as people wait for the grand design to emerge. What if the same energy spent on structural solutions for health care would have been spent on identifying, testing and refining successful ways of working in the actual front-line work of prevention and cure? Some students are thinking in new ways. I was recently a judge in the Aalto Strategy Case Competition, where students were asked to present ideas for YLE (Finnish BBC equivalent). When a decade ago I was still competing actively in case competition, I think 100% of teams (including mine) would have proposed a “grand design” and a delivery plan based on a diagnosis of the facts given in the case. Now, 50% of the teams were still in the waterfall world, but the other half actually saw that a lot of experimentation, and experimentation culture, would be needed for YLE to find its place in today’s media world. And their solution was on how to iteratively make that “build, measure, act” approach work at the scale of YLE. Some companies are thinking in new ways. We have innovative, often IT-focused, companies who have challenged the traditional ways of working. They have left the hierarchical organization model behind and are experimenting with more agile ways of organizing. They are launching products and changing strategy based on the frontline information from customers, not annual strategy processes. But how to scale this type of thinking to the wider population in Finland? We are now 3/4 on our way through our mission of meeting a dozen Finnish home care providers. The purpose of these meetings is to explain the Buurtzorg model for home care (autonomous self-organizing nurse teams, more patient focused care and other improvements) and gauge the interest for implementing something similar in Finland. Overall very positive response to the idea and the vision. The model resonates especially with people who have a nursing background, who clearly recognize the discrepancy between the current state and the ideal. Medical care – includes tasks such as caring of wounds, and needs to be performed by a nurse. A “practical nurse” (lähihoitaja”) can take care of most of medical tasks, but for medication related topics a “registered nurse” (sairaanhoitaja) is needed. Hourly wage is around 13-15 EUR. Non-medical care – includes e.g., helping the patient run errands, walk outside or cleaning the house. These can be performed without formal qualifications, and typically the wages are slightly above minimum levels at 8-11 EUR per hour. Often patients have a mix of medical and non-medical care staff. Depending on the patient and the vendor, the non-medical care can often be provided on a fairly non-fragmented basis (same person, weekly schedule of care with 2-3 hour slots every second day or similar rhythm of ~30 hours per month) whereas the medical care visits tend to be as short as possible and are often fragmented. Fragmentation is a real problem also in Finland. In one dataset I analysed, the customers receiving more than 6 hours / week of care (ie. requiring assistance beyond just non-medical care) had on average 14 different nurses visiting them within a 2 month time period, and their “primary nurse” (who saw them most) only made about 20% of the visits. For non-medical care, customers who only need 2-5 hours / week of service are in a better position. Quite often the companies are able to plan for a single person to do all the visits. The way that the services are purchased by the public sector. The competitions and RFQ’s typically ask for the lowest possible price per 20 minute nursing slot, depending on the time and type of “product” offered. Quality receives only minimal share in the weightings used, and even then it is more based on specific criteria (e.g., usage of mobile tracking system) or CV’s of the nurses – not the actual quality of the service. There are some exceptions, e.g., in Jyväskylä patients were given the opportunity to switch between two providers based on the perceived quality of the care. The nursing tradition. Often nurses are accustomed to hierarchical organization models, where the culture favors “doing as told” rather than being a self-stater. I heard this especially from former nurses, whereas top management in many companies was more optimistic on the ability of nurses to become self-organized. The journey continues still with two private sector meetings (two very big companies offering home care), and then with a few meetings with the purchasing side ie. municipal representatives. Meanwhile, three separate companies have expressed explicit interest in continuing discussions and piloting the Buurtzorg model in Finland – stay tuned! When company management and their external advisers talk about large-scale fundamental change, the typical analogy used is that of the butterfly turning from a pupa to an adult with wings. The desire is to do a “transformation” – dramatically, rapidly and irreversibly changing the company. When it comes to organizational change and transformations, an often quoted statistic is that ~70% of the changes fail – no butterfly emerges from the pupa. Reasons for failure are typically labelled as “resistance to change” – the organization does not embrace the new ways of working developed by the top team in isolation during the preparation phase. Interestingly, a similar failure rate is quoted for software projects using the “waterfall approach”. The waterfall approach is similar to the model for organizational change depicted above – first design the software, then code it, and then hand it over to the user to see what (if anything) happens. In software projects, companies are increasingly turning to agile methods for coding. The idea is to break the long development phase into shorter cycles with the aim of having a working product (even if crude and unfinished) after each. The end users can experience the product and are encouraged to give new guidance on desired features – whereas in the waterfall paradigm these “changing customer requirements” were seen as the worst type of evil. Success rates are up to three times higher for agile projects compared to waterfall methods. Image from Lowe et. 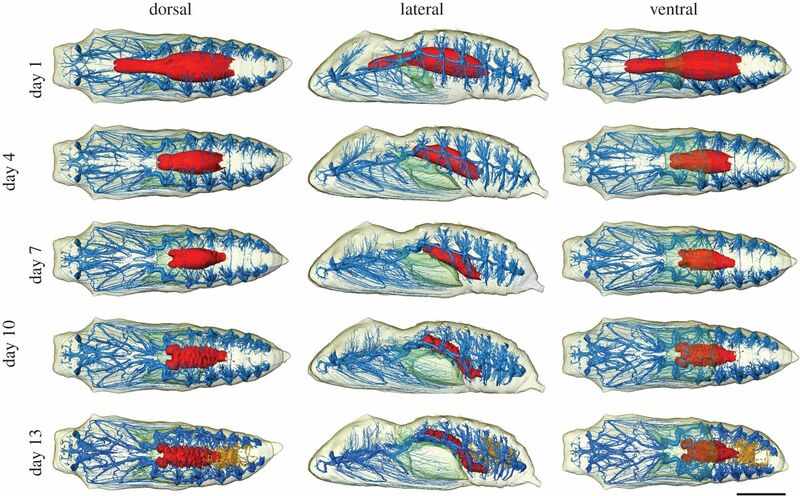 al (2013): “Metamorphosis revealed: time-lapse three-dimensional imaging inside a living chrysalis”. Interface, vol 10 issue 84. Published under Creative Commons Attribution License. So next time you are planning a transformation, don’t focus just on the butterfly, but on all the intermediary stages in between. How to involve the whole organization into gradually and iteratively changing towards a better state? How to avoid the embarrassing moment when you announce something developed in isolation by the top team to the whole organization, and experience frustration, fear and confusion instead of the “aha moment” you were hoping for. Transforming home care in Finland? As a part of our research project described earlier (in this post), we hope to act as a catalyst for change within Finnish home care industry. Home care in Finland suffers from the problem of limited nursing resources and increasing number of (mainly elderly) patients, which currently manifest themselves in low satisfaction among both patients and nurses. We are now meeting with dozens of companies providing home care (ranging from the very small to the very large), to highlight a way to do things differently: the Buurtzorg model that has been successfully applied in the Netherlands. Buurtzorg has implemented a non-hierarchical leadership model built around self-organizing nurse teams supported by a very lean central HQ. Since their founding in 2006, they have scaled to ~8000 nurses today. Both patients and nurses report increased satisfaction, and the efficiency has skyrocketed as well. For more information, check out e.g., this case study. We are finding that the idea of letting go of hierarchy, having self-organizing nurse teams, truly embracing the customer context (not optimizing minutes per visit, but customer health and social connections) and fast scaling of the business as done by Buurtzorg sound attractive to the companies we are talking with. Implementing this model at scale (in home care and beyond) in Finland could provide efficiency gains well above those that any structural solutions (e.g., SOTE) could bring. When treated holistically and with respect using the Buurtzorg approach, patients need less hours of care in total and are less likely to need expensive hospital care. If interested, please get in touch! Transforming home care in Finland? Part 3 – the pilot!